Now, we have been discussing about incarnations. These incarnations are concerned so far the maintenance of the material world is required. In the spiritual world there is no incarnation. There is a permanent situation of the spiritual planets, and in different planets, He, Kṛṣṇa, has different expansions under different symbolic representation, and they are differently named. There is no change. But in the material world, when we speak of incarnation, that is in relationship with this material world. In this… For the material world these incarnations are expanded. And what are they? First the puruṣāvatāra; then līlāvatāra; then guṇāvatāra, three; then manvantarāvatāra, four; then yugāvatāra, five; and then śaktyāveśāvatāra. Śaktyāveśāvatāra. [Bg. 4.7] There is a system. In the process of this material world there is a system. Just like for maintenance of your state, United States, there is system of government, and there is an aim. Just like your government does not like that…, there should be no Communistic persons, and you write that “We trust in God.” It is better to trust in God. You have got a system. Similarly, the maintenance of the whole material world, there is a system. It is not blind. Foolish creatures, they think that everything has come out of nothing, and it is being managed by nature. No. Behind nature there is God. In the Bhagavad-gītā you have learned, mayādhyakṣeṇa prakṛtiḥ sūyate sa-carācaram: [Bg. 9.10] “Under My superintendence the material nature is working.” Material nature is not blind. Just like foolish person, because he cannot see President Johnson and the governmental personalities, they think, “It is going on. Nobody is there behind this government, and it is going on.” So similarly, persons who have no knowledge in the affairs of this material world, they think that “This material nature is working, and automatically, by magic, the sun is coming out, the moon is coming out, and the season is changing, and everything is going on just like magic, and we are the master of everything.” Never think…, these foolish persons never think that they are not masters, they are servant, servant of the material nature. So that is their foolishness. Therefore, when there is too much foolishness, so there is need of avatāra, incarnation, to correct. Yadā yadā hi dharmasya glānir bhavati [Bg. 4.7]. Whenever there is, I mean to say, discrepancies in the maintenance of law and order of this material nature, there is need of avatāra, incarnation. Because it is God’s kingdom, it is also secondary kingdom—real kingdom is in the spiritual world—so God comes in different avatāra. And when the material world is created, the first avatāra is puruṣa-avatāra. The Mahā-Viṣṇu, Garbhodakaśāyī, They create. And then līlāvatāra. Līlāvatāra, under some particular circumstances, to save some particular devotee, or to display some particular feature… Just like Lord Rāma, He incarnated. He is līlāvatāra. Then guṇāvatāra. For maintenance of this material world there are different kinds of modes of nature, and to control those modes of nature there are avatāras, Brahmā, Viṣṇu, Maheśvara. Līlāvatāra. Then manvantarāvatāra. The changes of millenniums, that manvantarāvatāra. And then yugāvatāras, yugāvatāra, in each and every yuga. Just like this Kali-yuga. This is called Kali-yuga. In the Kali-yuga the incarnation is Lord Caitanya. [SB 11.5.32] “Now, in this age of Kali-yuga, there will be avatāra, incarnation, who is Kṛṣṇa, but His color of the body is not black.” That is Lord Caitanya. Lord Caitanya was very fair complexion, nice looking. So kṛṣṇa-varṇaṁ tviṣā. Tviṣā, by complexion, He is not Kṛṣṇa, but He is Kṛṣṇa. Kṛṣṇa-varṇam tviṣākṛṣṇam and sāṅgo ‘pāṅgāstra-pārṣadam. And He is associated by His confidential, I mean to say, devotees. You’ll find Lord Caitanya always crowded by His devotees, always. His dancing mood—you have seen the picture. Special associates, that Advaita, Gadādhara, Nityānanda. So that incarnation, who is Kṛṣṇa, but His color, His complexion, is not black, but He is associated with devotees… And the process of worshiping that incarnation is to chant Hare Kṛṣṇa, Hare Kṛṣṇa, Kṛṣṇa Kṛṣṇa, Hare Hare. So in this yuga, this Kali-yuga, incarnation is Lord Caitanya, and the process of worship is this sound vibration. That is mentioned. In every avatāra, every incarnation… Just like Lord Buddha. His name is also mentioned. And there will be another incarnation, Kalki. That is also mentioned. So they are mentioned, yugāvatāra. And śaktyāveśāvatāra. Śaktyāveśāvatāra. All avatāras, their mission is to preach the message of God. Avatāra has no other business. The message of God. Śaktyāveśāvatāra. This Hare Kṛṣṇa, Hare Kṛṣṇa, Kṛṣṇa Kṛṣṇa, Hare Hare/ Hare Rāma, Hare Rāma, Rāma Rāma, Hare Hare, this is also considered śaktyāveśāvatāra, the incarnation of sound. Incarnation of sound. It is described by Lord Caitanya that kali-kāle nāma rūpe avatāra: “In this Kali-yuga, in this age, this incarnation of name—Hare Kṛṣṇa, Hare Kṛṣṇa, Kṛṣṇa Kṛṣṇa, Hare Hare—to give facility to the conditioned soul.” They cannot do anything. It is very difficult to perform any other religious rituals. This, the best anywhere, everywhere—you can chant Hare Kṛṣṇa, Hare Kṛṣṇa. Nāmnām akāri bahudhā nija-sarva-śakti. Śakti, this word is used, śakti. And from śakti, that energy, śaktyāveśāvatāra. So this name is also śaktyāveśāvatāra. And when Kṛṣṇa personally comes, He can be seen in two features, bālya, paugaṇḍa: His childhood and boyhood, up to sixteenth year. That is the real feature of Kṛṣṇa, kiśora. And further features, that is expansion of Kṛṣṇa, Vāsudeva. Vāsudevaḥ sarvam iti [Bg. 7.19]. Now, He is concluding about the topics of incarnation, that “There are innumerable incarnations of Kṛṣṇa. Nobody can count.” He is giving the example = just like nobody can count how many waves are flowing in the river or in the ocean, similarly, it is impossible to count how many incarnation are there. [Bg. 4.9] Anyone who understands about the appearance and disappearance of God or His incarnation, simply by understanding this, one is liberated. And that person who understands, after quitting this material body, no more he comes here, but he goes back to Godhead to become one of His associates. Such persons who knows about the incarnations, they are not impersonalists. Therefore they do not merge in the impersonal Brahman feature, but they go to the different spiritual planets. So viṣṇos tu trīṇi rūpāṇi: “That Viṣṇu, for the creation of this material world, takes into three forms, trīṇi rūpāṇi.” Viṣṇos tu trīṇi rūpāṇi purusākhyāny atho viduḥ: “And all of them are known as puruṣāvatāras.” Mahā-Viṣṇu puruṣāvatāra, Garbhodakaśāyī Viṣṇu puruṣāvatāra and Kṣīrodakaśāyī Viṣṇu puruṣāvatāra. They are called puruṣāvatāra. Ekaṁ tu mahataḥ sraṣṭṛ: “And the first puruṣāvatāra, who is called Mahā-Viṣṇu, He creates the material ingredients, which is called mahat-tattva.” Everything requires ingredients. So the, I mean to say, original ingredients, the, what is called, subtle ingredients, they were created first by this Mahā-Viṣṇu. Then, from those ingredients, universes were produced. And each universe, ekaṁ tu mahataḥ dvitīyaṁ tv aṇḍa-saṁsthitam. The first puruṣāvatāra, Mahā-Viṣṇu, creates the ingredients, and the second Mahā-Viṣṇu enters in each and every universe. He is called dvitīya. And tṛtīyaṁ sarva-bhūta-stham: “And the third, He enters into the body of all living entities, Paramātmā, or the Supersoul.” This is the division of three first incarnation. Now, Kṛṣṇa has immense potencies, which are divided into three. What is that? Icchā-śakti, kriyā-śakti, jñāna-śakti. Icchā-śakti means His potency, whatever He wishes, that can be done, icchā. Kriyā-śakti: then activity, kriyā-śakti. And jñāna-śakti, knowledge, knowledge. In the Vedic literature it is said, parāsya śaktir vividhaiva śrūyate svābhāvikī jñāna-bala-kriyā ca [Cc. Madhya 13.65, purport]. Svābhāvikī jñāna-bala-kriyā ca. Just like one potency is working, producing flowers, producing flowers. We are seeing that a flower is being produced automatically, so nicely scented, so nicely colored. But because we are fools, therefore we think it is being produced automatically. No. It is produced by the kriyā-śakti, by the active potency of God, kriyā-śakti. Jñāna-śakti: and there is such perfect knowledge that nobody can see any defect. You see a butterfly, how it is nicely painted. You just see duplicate in both the wings. Just like an artist paint nicely, it is painted. So we think it is coming out of nothing. This is our foolishness. Here is, that it is coming out of the jñāna-śakti. But His jñāna is so wide that simply by His desire, simply by His will, it can be executed. These are the things to be studied. Because we cannot see something before our eyes, that does not mean there is no existence. There is existence, but we do not know how one is working, how one is working. Svābhāvikī jñāna-bala-kriyā ca. Svābhāvikī jñāna-bala-kriyā. Just like you see the anatomical condition of your body. Now, how this body is produced, how nicely, that every mechanical arrangement, the eyes [piece? ], and the…? Just like a big factory and big office. The brain is the office, and stomach is the factory, and it is creating energy, it is coming to the heart and another place… Just like soap factory. Sometimes, in some place, it is being, some part of the manufacture is finished, another… In this way it is going on. But it is coming out a small pea. And how it is developing. In everything you can see. You take a seed, how it develops, a great tree. How much potency is there. So svābhāvikī jñāna-bala-kriyā ca. Everything is being done. I do not know. I claim, “It is my body,” but I do not know how even a hair is growing. I do not know how it is replaced. I cut in the morning, and the next day, I see again there is. So these things are going on. Svābhāvikī jñāna-bala-kriyā ca. We have to study God’s activity in this way, so many things, nature’s study. So those who are intelligent, they can see that these things are working. What is that? Icchā-śakti, kriyā-śakti, jñāna-śakti, these three potencies of God, Kṛṣṇa, is working. So this icchā-śakti, this potency of will, supreme will, and the potency of supreme hand and the potency of supreme knowledge, these three things are conducting all affairs in this material world. And the potential activity, that is being done by the expansion of Saṅkarṣaṇa, either in this material world or in the spiritual world. So parāsya śaktir vividhaiva śrūyate [Cc. Madhya 13.65, purport]. In this way the Lord is working in so many ways, and because we have no knowledge, we think that “There is no brain behind it. There is no knowledge behind it. Everything is coming out automatically, and we are the master of everything.” That is called illusion. So by Kṛṣṇa consciousness, you will be free from this illusion, and you will know how God is working by His different potential power. 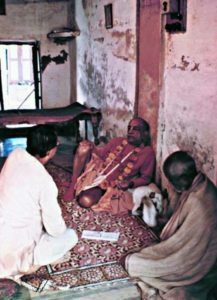 The entire collection of Srila Prabhupada Books in our Archive. Also many video and audios.